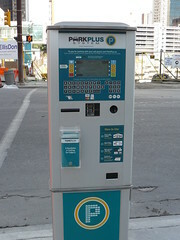 To provide a deeper insight into ParkPlus, I’ve also taken time to interview CPA’s general manager Mr. Dale Fraser and Calgary Alderman Mr. Dale Hodges, two of the participants in the creation of the ParkPlus system. You may not realize this but Calgary Parking Authority is a completely self-funded operation. In 2007, after expenses, CPA actually *paid* a total of $17.9 million to the City of Calgary (an $1.9 million increase from $16 million in 2006). Now, observant readers will notice that old style parking meters sometimes got vandalized or money stolen. To give you a rough idea of the monetary impact, CPA’s meter repairs, parts, and overtime costs have totaled more than several hundred thousand dollars since 2006. I will mention how ParkPlus addresses these challenges in “The Technologies” section. For the financial and business types, you can download a copy of CPA’s Financial Statements here. 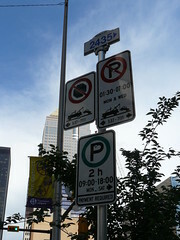 And by eliminating the painted lines defining curbside parking spaces, CPA has also managed to allow more cars to be parked on the streets of downtown Calgary. And I’ve been reassured by CPA that they have even collected statistics to confirm that 20% more cars are able to park than before. By the way, more parking spaces also means happier Calgarians (less time wasted to hunt for a parking spot) and increased revenue for CPA. 3) Cellphone and Web-based user account system designed and implemented by MTS Allstream. Here is a video of ParkPlus enforcement vehicle in action. 2b) And there is an efficient solar cells on top of the pay machine. The machine can run for weeks with a fully charged internal battery. 3) The cell phone payment system allows users to create an account online with the user’s cellphone number and license plate information and then put some money into his/her account. 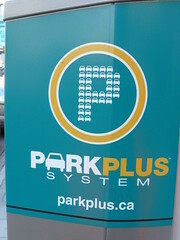 After creating an account, if the user wants to park at a ParkPlus Zone, he/she can simply call the ParkPlus system’s phone number (403-537-PARK (7275)). And then pay by entering the parking zone, and the system will charge for the maximum allowed time. And if the user returns before the parking time expires, the user can simply call the system and the unused portion will be refunded to the user’s account. The user can even use the system to set up a reminder and have the system calls the user minutes, say 5 minutes, before the parking time expires! During my interview with Dale, CPA’s General Manager, he mentioned that the CPA has applied for worldwide patent protection of the ParkPlus system. As someone interested in intellectual properties like patents, I have always tried to learn more about the key ideas behind interesting patents. So I’ve tried various US patent searches to try to find the ParkPlus related patent(s) (including this search with 2 results not related to ParkPlus and this search with no results at publication time). I look froward to reading ParkPlus’ patent application when it becomes public. I enjoy reading patents because they teaches us a lot of interesting things. Plus some patents are strong while some other patents may become invalid when under closer scrutiny. Anyway, the ParkPlus patent application should be a good read. Because of the efficiency of ParkPlus enforcement vehicle, my days in committing “rational crime” is probably numbered (or greatly reduced). (big smile) Have a read of the above linked Financial Times interview for more info if you like. It is a fun read. Now, saving the best for now, here is a video me interviewing CPA General Manager Dale Fraser and Alderman Dale Hodges. Enjoy. I am not a lawyer, but I think Calgary Parking Authority still has to abide by the Personal Information Protection Act (PIPA). What concerns me here is CPA’s systematic storing of license plates information captured by the ParkPlus enforcement vehicle. Dale, CPA’s General Manager, suggested that since the license plates information are in clear view on the street already therefore they can be considered “public” information. The example given by Dale was we can go out onto the street today and start writing down all the license plates numbers, precisely where these vehicles are located, and at what time, thus there is nothing new or wrong with the data collected by ParkPlus. In my humble opinion, the problem with Dale’s argument is that it ignores the systematic, complete, and efficient nature of these captures. Now, imagine if I had outfitted my car with cameras and infrared laser like a ParkPlus enforcement vehicle and started driving around downtown capturing license plates information. I will be very surprised if my camera-equipped car roaming downtown does not lead to puzzling looks by Calgarians or even being stopped for questioning by the police. I don’t ever want to see Canada becoming a “surveillance society” like the UK (see reports from BBC, Guardian, and CNet). The information collected by ParkPlus and potentially dangerous precedence set by ParkPlus may be the first step on a slippery slope towards a surveillance society. To better appreciate what a surveillance society is like, I recommend reading this BBC report and scanning the UK Information Commissioner surveillance society report (PDF file) to gain some perspective on surveillance. If you are concern about the legality and the potential invasion of privacy by the ParkPlus enforcement system, you may wish to contact the office of the Privacy Commissioner of Alberta, Mr. Frank J. Work. And ask the OIPC to investigate and publicly report on the privacy measures CPA needs to institute to ensure the protection of the privacy of Albertans. I think ParkPlus is a truly revolutionary and state-of-the-art parking system that reinvents parking. At the same time, I won’t allow my admiration of the cutting-edge technologies and potential monetary benefits to overshadow my desire to see Canadians’ rights to privacy be respected and protected. 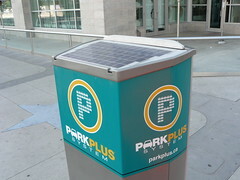 1) Here are some more reading materials if you wish to learn more about the ParkPlus System. 2) Without turning this note into a lengthy essay, I have chosen to skip the discussion of whether police should be allowed to use ParkPlus data (those that have no parking violations) without court supervision. You see, even the US FISA has an FISC. 3) Here is a Globe and Mail blog entry about Google Streetview where they take candid snapshots from the street. 4) Here is an earlier version of info sheet about the ParkPlus system. This entry was posted on Thursday, August 14th, 2008 at 10:26 AM and is filed under Business, Calgary, Canada, Economics, Entrepreneurship, Google Video, InterviewByKempton, InterviewByKempton-Business, patent, privacy, Reimagining-the-Wheels, Science & Technology, security, Video. You can follow any responses to this entry through the RSS 2.0 feed. Both comments and pings are currently closed. Mr. Dale Fraser’s argument that license plates when in open view are public information is flawed as far as Canadian privacy statues and case law is considered. He is referring to the US law. Under the US case law, once a person “exposes” his/her private information that person has no longer any expectation of privacy. Under Canadian law (as well as law of European countries), a person does not loose his privacy rights even if the information or an exhibit becomes public. If I accidently leave my bank statement on a bench in a park, my bank statement is no longer private information in US, but in Canada it is still private information, no one can publish it or use it for any, even “legal” purpose. Thanks a lot for your comments. I like the analogy of the bank statement one a bench. Can you provide any legislation (chapter and section with link) or any case laws that support your claim? I am really curious to see the Canadian case laws or reference. Do you know if the system meets PCI-DSS security standards? If it doesn’t I’d be concerned not just about privacy but the safety of credit card data. Last I looked at the system security briefly, I wasn’t worried about the encryption of the credit card data. Data encryption, etc are not rocket science anymore and I will be very surprised if ParkPlus mess it up. Of course, I don’t have visibility of how the system do the encryption and handle the security so I can’t be sure. But like I said, I am incline to think they’ve done it right.